"The Pugger-Mixer is a mixer that unloads itself and a pugmill that feeds itself"
It recycles scrap as well as mixes from dry powder. 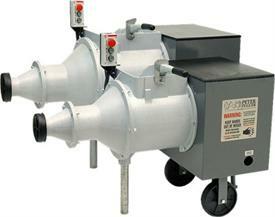 Complete processing of your clay in one machine saves you space, money, and best of all, your time. Since 1975, the Pugger-Mixer continues to support potters and institutions worldwide. The PM-50 has a maximum batch size of 135 Ibs. of moist clay (Capacities vary depending on clay condition, type, moisture, etc). On Wheels:The PM-50 comes with 8" diameter wheels. They are easily transported for cleaning or storage.